Night number three of the Democratic National Convention in Philadelphia. 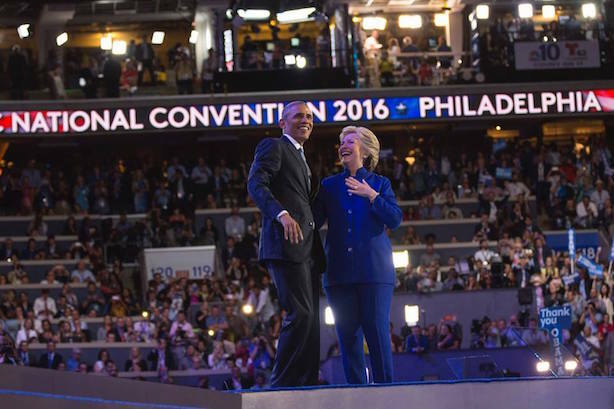 President Barack Obama and Hillary Clinton on stage at the Democratic National Convention on Wednesday night. (Image via the convention's Facebook page). President Barack Obama delivered one of the more memorable speeches of his presidency on Wednesday night, endorsing Hillary Clinton and rebuking Donald Trump as a pessimistic and authoritarian threat to American democracy. Obama cast the 2016 presidential election as a choice between optimism, saying he was more confident in the U.S. now than when he took office, and the pessimism displayed at last week’s Republican National Convention in Cleveland. Obama followed speeches by former New York City Mayor Michael Bloomberg, Vice President Joe Biden, vice presidential nominee Tim Kaine, and former Defense Secretary Leon Panetta. What to watch tonight: Chelsea Clinton will introduce her mother before she makes the headline speech at the Democratic convention. Donald Trump’s daughter, Ivanka, similarly introduced the Republican nominee before his speech at the GOP convention last Thursday. Bloomberg scores. Former New York City Mayor Michael Bloomberg, who isn’t even a Democrat, landed the most memorable line of either convention to date, saying the country should elect a "sane, competent person" with international experience. He added: "I’m a New Yorker, and I know a con when I see one," referring to Trump. Donald Trump’s Ask Me Anything session on Reddit was relatively uneventful, with questions thoroughly screened throughout the digital Q&A. Wired: Welcome to the bizarro world of Trump supporters on Reddit. Twitter reacts to Kaine’s "dad humor." Users lightheartedly poked fun at vice presidential nominee Tim Kaine’s impressions of Donald Trump and regular guy approach to taking the Democratic stage in prime time. On a more serious note, the Virginia senator also touched on his Marine son’s departure for Europe. Tin Kaine totally does these impressions at home and laughs while his family rolls their eyes. In the background: Trump’s Russia comments. The lead-up to Wednesday night’s events in Philadelphia was dominated by Trump’s comments seemingly inviting Russia to intervene in the presidential election. The statement was hammered by intelligence and diplomatic officials, whose responses varied from calling it irresponsible to a national security threat.